Using this book, you will learn how to use jQuery’s powerful DOM manipulation tools to dynamically update content on your site. You will be able to extend jQuery’s capabilities by writing your own plugins on top of the framework, animate elements, build your own jQuery elements, employ best practices, and avoid common errors. Practical jQuery teaches you how, with jQuery, you can unit test and refactor your code. 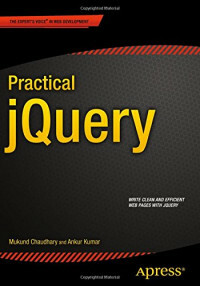 You’ll see how expressive yet concise jQuery’s code is and how much quicker and efficient it is to develop with jQuery. Get a fundamental perspective on how jQuery works, how to understand, select, and build your own plug-ins, and how to make sure your projects run at the peak of their potential performance using Practical jQuery today.